Although three-dimensional video has long been imagined -- Princess Lea's recorded plea to Obi-Wan Kenobi in the 1977 Star Wars movie comes to mind -- it has been slow to show up in the real world. This is because three-dimensional video is orders of magnitude more complicated than ordinary video. Researchers from the University of Texas have devised a three-dimensional video system that cuts down the compute power needed to project three-dimensional images by using an 800,000-mirror device designed for two-dimensional digital projectors as a sort of holographic film. "Our system provides a simulated hologram capable [of] dynamic, truly holographic 3D images like 3D movies," said Michael Huebschman, a research physicist at the University of Texas Southwestern Medical Center at Dallas. The approach could be used to make three-dimensional heads-up displays, medical images, and computer games. It could eventually lead to three-dimensional movies and television. Our sense of sight depends on the way light reflected from an object's surface hits our eyes. Light from a dark area of the object has a smaller amplitude than light from a bright area. Light waves also interfere with each other. When waves are in opposite phases, meaning the crest of one light wave coincides with the trough of another, the waves cancel each other. When two crests coincide, they are in phase and they reinforce each other. And how out of phase two light waves are determines the amplitude of the point where they intersect. A hologram is a representation on a single plane of all of the phase information, or interference pattern, of the light coming from an object. It creates a three-dimensional image by projecting the interference pattern reflected by a real object. Holograms are made by bouncing a laser beam off an object and having a second laser beam intersect the reflected light. The laser beams interfere with each other, producing the requisite pattern of bright and dark areas. The pattern is captured in a light-sensitive medium. Holograms are seen when light hits the storage medium at the same angle as when the hologram was recorded. The researchers hit on the idea for their holographic video when they realized that the mirrors of a digital micromirror device could function like the light-sensitive grains of holographic storage media, said Huebschman. In the researchers' system, the hologram is stored as information in a computer rather than physically stored in a medium. The computer controls the digital micromirror device. In their original use projecting two-dimensional digital video, the micromirrors project light waves of different amplitudes. 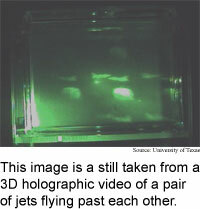 The researchers modified the device so that the mirrors projected the phase interference pattern of a hologram. "The inspiration was realizing that the micromirrors of the DMD are just large grains in a piece of film, and if a suitable hologram could be computed and that image placed on the DMD, it would interact with coherent light and then should function like a film hologram," he said. The digital micromirror device is made up of 800,000 mirrors that are 16 microns across, which is about three times the size of a red blood cell. It is connected to a computer that controls the angles of the mirrors. Any of 256 shades of gray can be projected onto each of the mirrors at any time, providing a black and white holographic projection that can be controlled in real-time to make three-dimensional video. "The mirrors... being off or on are like the grains in a film emulsion being exposed or not," said Huebschman. "The shades of gray on the DMD hologram are analogous to the shades of gray of the grains in the emulsion hologram," he said. One challenge to getting the device working as a holographic projection system was the size of the mirrors, according to Huebschman. Despite their relatively small size, the mirrors are larger than the grains of material that make up film, which limits the available projection angles. The method can eventually be used in several types of three-dimensional displays, according to Huebschman. It is especially appropriate for heads-up displays in aircraft, military control systems and air traffic control systems, he said. These applications have three things in common, said Huebschman. A three-dimensional view would allow a viewer to gain an additional element of information from a device he ordinarily uses; the device can be updated quickly; and all that needs to be projected to provide the extra information is a simulated object. Further down the road, with better three-dimensional resolution, the method could be used to bring three-dimensional images to scientific workstations, computer games, flight simulators, x-rays and other types of medical imaging, and movies. The combination of the device and real-time digital hologram recording equipment, which is yet to be developed, would make three-dimensional live television possible, said Huebschman. Several other research projects are also aimed at providing three-dimensional video. A system developed by Actuality Systems, Inc. projects pixels in space to build a three-dimensional scene. These pixels are timed to reflect off a rotating plate so that they scatter to the correct locations at the right times. The University of Texas method takes less compute power than the three-dimensional pixel system because it uses the hologram to organize light patterns, said Huebschman. "That information is already available in a hologram," he said. Another method developed at the Massachusetts Institute of Technology converts holograms into a pair of two-dimensional stereo views, then projects the images onto a user's eyes. "We start with a similar computer-generated hologram but rather than using complex opto-electric elements to project a stereo image, we project the image which results from the defraction of... light by the hologram," Huebschman said. The Texas work takes a new approach to three-dimensional holographic video, said Hiroshi Yoshikawa, an associate professor of electronics and computer science at Nihon University in Japan. The interesting point is that the researchers are using phase modulation rather than amplitude modulation to achieve the dynamic three-dimensional projections, he said. The researchers' next steps are making color holograms, improving the display equipment, and making a mobile, heads-up virtual image viewer, said Huebschman. "We are ultimately aiming for 3D TV," he said. One of the main challenges is making larger arrays of digital micro mirror devices that have smaller mirrors, Huebschman added. The method could yield practical three-dimensional heads-up displays in one to two years, x-ray machines in two to three years, workstations and flight simulators in three to five years, medical imaging equipment and movies in five to ten years, and live TV in 10 to 15 years, according to Huebschman. Huebschman's research colleagues were Bala Munjuluri and Harold R. Garner. The work appeared in the March 10, 2003 issue of Optics Express. The research was funded by the Texas Board of Higher Education Advanced Research Program, the University of Texas Southwestern Center for Biomedical Inventions and the National Cancer Institute. Related Elements: Technical paper, "Dynamic Holographic 3D Image Projection," Optics Express March 10, 2003.